This little city in northern Norway is beautiful. It sits 350 kilometers north of the Arctic Circle on the island of Tromsoya. People go to see the northern lights in the winter and the midnight sun in the summer. 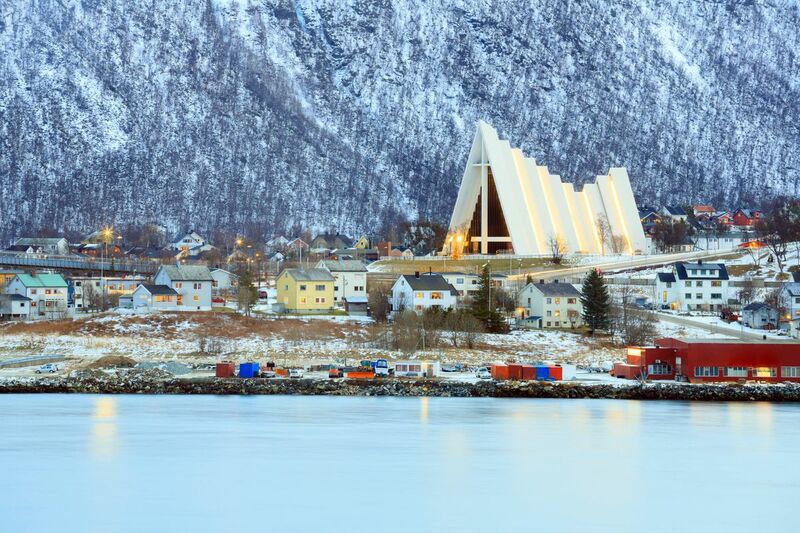 The Arctic Cathedral, the view from the cable car, and the surprisingly cosmopolitan downtown are must-see spots. Tromso is also home to some of the friendliest people in Norway. But be sure to get out of the city, as the surrounding countryside is even more breathtaking. Prefer your light show with a soundtrack? Turn up in Tromsø for the annual Northern Lights festival (in 2015, January 24–February 1). The nine-day celebration features more than 40 jazz, classical, dance, and electronic performances, with some events taking place outside, potentially under the aurora borealis. Stop in Emma’s Restaurant to refuel on fresh fish and local delicacies like reindeer meat, then make your way to the planetarium for some perspective on the science behind the lights. Tromsø is just north of the Arctic Circle, near the magnetic north pole, so it sees the lights regularly between October and mid-March. Quality student town right in the Arctic circle. To be honest there is not a massive amount to do in the town itself, but it is well located for chasing the Northern Lights. Not somewhere to stay too long, as the perpetual darkness can get a bit boring, but defo worth the visit if you're looking to see the Northern Lights or looking for some proper winter wilderness. A small village north of Oslo. Quaint cabins and inns. The real nordic experience. Good base from which to see the northern lights in the winter. Not a lot to do here. Except... catching the northern lights! Tromso is a small town in the arctic circle. It's pretty dark here in the winter, which is great for star gazing but not so conducive for a lot of other things. Luckily, the Norwegians are used to this so the city and even the trails for snow sports are clearly lit. Great for a cozy and relaxing escape where you don't want to be bothered.